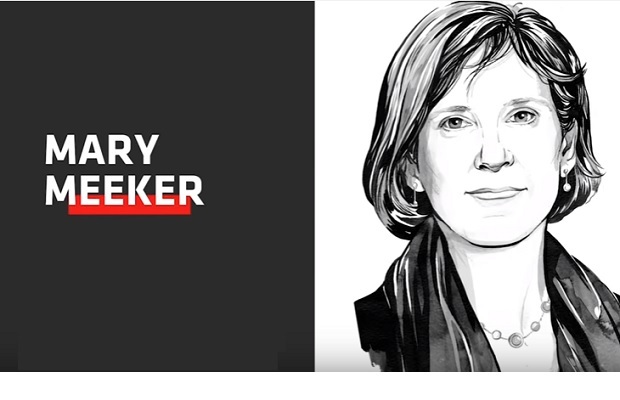 Meeker, a partner at Kleiner Perkins Caufield & Byers and technology investing luminary, presented her annual report on internet trends Wednesday at Recode's Code Conference. Her manifesto on the tech industry has become an annual event. In her presentation, Meeker warned that tech companies face a "privacy paradox." They must use more data to enrich their customers' experiences without betraying their trust. "Scrutiny is rising on all sides—users, businesses, regulators," Meeker said. "Technology-driven trends are changing so rapidly that it's rare when one side fully understands the other, setting the stage for reactions that can have unintended consequences." Meeker said the number of Internet users, 3.6 billion, surpassed half the planet's population. "When markets reach mainstream, new growth gets harder to find—evinced by 0% new smartphone unit-shipment growth in 2017," she said. This year, the 294 slides in rapid succession covered everything from smartphone behaviour in the U.S. to tech company competition in China. •	2017 was the first year in which smartphone unit shipments didn’t grow at all. As more of the world become smartphone owners, growth has been harder and harder to come by. The same goes for internet user growth, which rose 7 percent in 2017, down from 12 percent the year before. With more than half the world online, there are fewer people left to connect. •	People, however, are still increasing the amount of time they spend online. U.S. adults spent 5.9 hours per day on digital media in 2017, up from 5.6 hours the year before. Some 3.3 of those hours were spent on mobile, which is responsible for overall growth in digital media consumption. •	Despite the high-profile releases of $1,000 iPhones and Samsung Galaxy Notes, the global average selling price of smartphones is continuing to decline. Lower costs help drive smartphone adoption in less-developed markets. •	Mobile payments are becoming easier to complete. China continues to lead the rest of the world in mobile payment adoption, with over 500 million active mobile payment users in 2017. •	Voice-controlled products like Amazon Echo are taking off. The Echo’s installed base in the U.S. grew from 20 million in the third quarter of 2017 to more than 30 million in the fourth quarter. •	Tech companies are facing a “privacy paradox.” They’re caught between using data to provide better consumer experiences and violating consumer privacy. •	Tech companies are becoming a larger part of U.S. business. In April, they accounted for 25 percent of U.S. market capitalization. They are also responsible for a growing share of corporate R&D and capital spending. •	E-commerce sales growth is continuing to accelerate. It grew 16 percent in the U.S. in 2017, up from 14 percent in 2016. Amazon is taking a bigger share of those sales at 28 percent last year. Conversely, physical retail sales are continuing to decline. •	Big tech is competing on more fronts. Google is expanding from an ads platform to a commerce platform via Google Home Ordering. Meanwhile, e-commerce giant Amazon is moving into advertising. •	People are spending more on health care, meaning they might have to be more focused on value. Meeker asks: “Will market forces finally come to health care and drive prices lower for consumers?” Expect health care companies to offer more modern retail experiences, with convenient offices, digitized transactions and on-demand pharmacy services. •	The speed of technological disruption is accelerating. It took about 80 years for Americans to adopt the dishwasher. The consumer internet became commonplace in less than a decade. •	Expect technology to also disrupt the way we work. Just as Americans moved from agriculture to services in the 1900s, employment types will again be in flux. This time, expect more on-demand and internet-related jobs to predominate. •	Internet leaders like Google and Amazon will offer more artificial intelligence service platforms as AI becomes a bigger part of enterprise spending. •	China is catching up as a hub to the world’s biggest internet companies. Currently, China is home to nine of the world’s 20 biggest internet companies by market cap while the U.S. has 11. Five years ago, China had two and the U.S. had nine. •	Immigration remains important for U.S. tech companies. More than half of the most highly valued tech companies in the U.S. are founded by first- or second-generation immigrants. Uber, Tesla, WeWork and Wish all have first-generation founders.